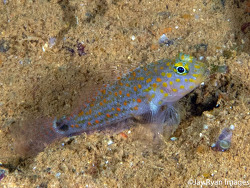 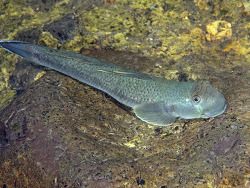 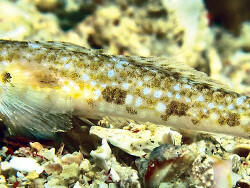 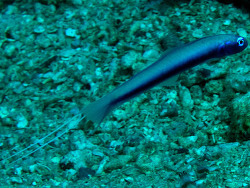 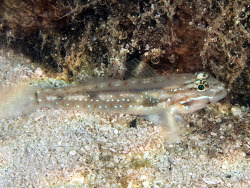 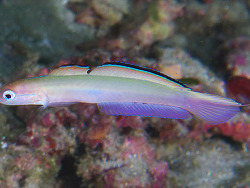 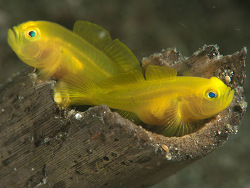 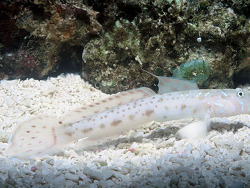 Gobies are the largest group of marine fishes and account for a major fraction of the world's tropical small-fish bottom fauna on tropical reefs. 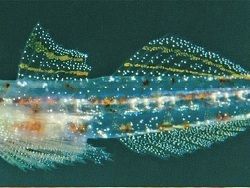 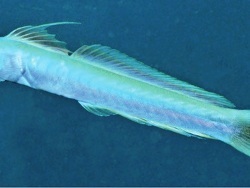 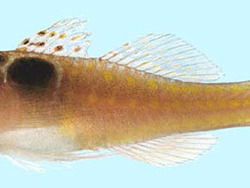 Most species live in, on, or near the bottom and are most very small size. 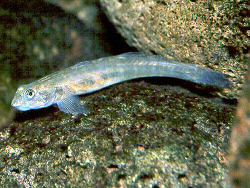 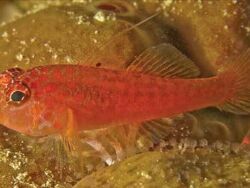 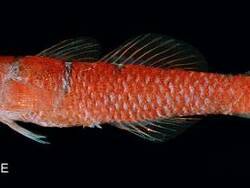 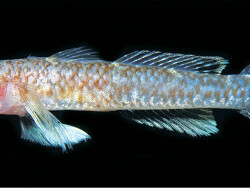 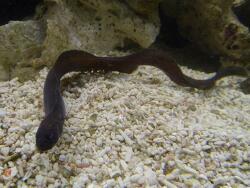 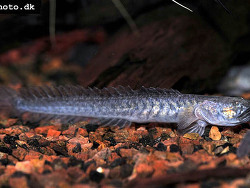 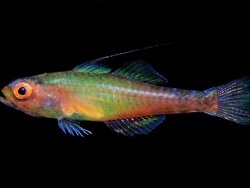 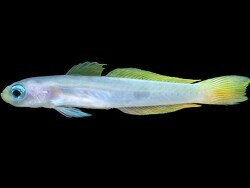 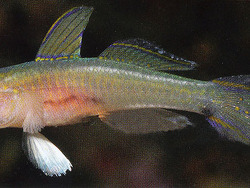 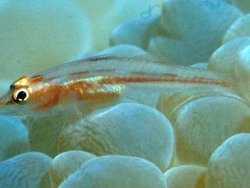 The family contains the world's smallest fishes and vertebrate. 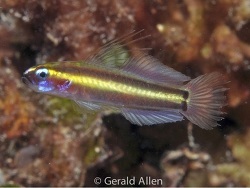 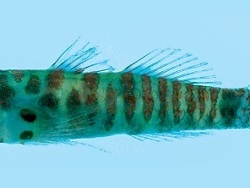 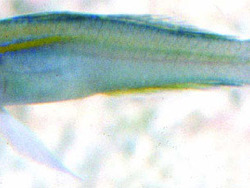 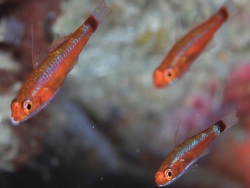 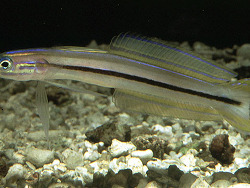 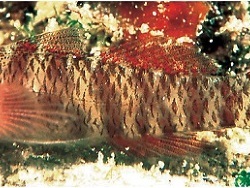 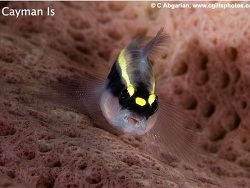 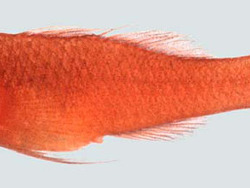 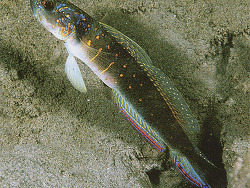 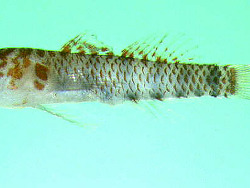 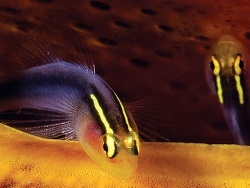 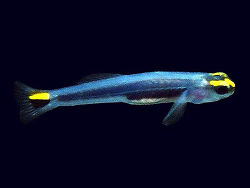 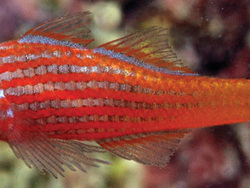 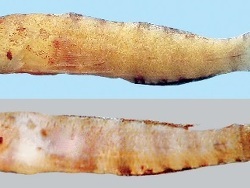 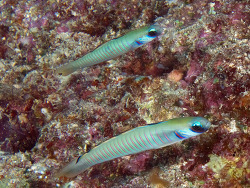 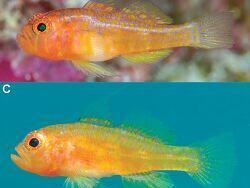 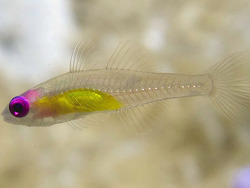 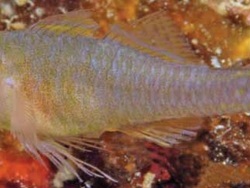 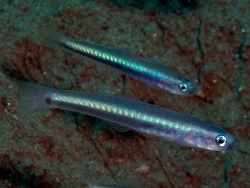 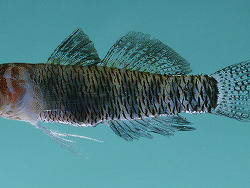 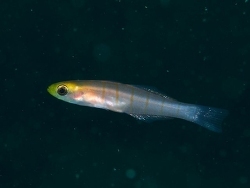 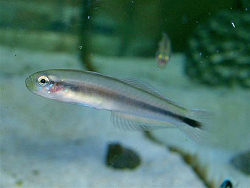 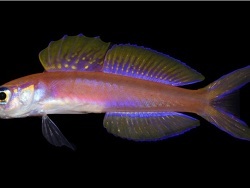 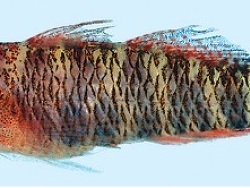 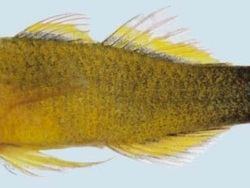 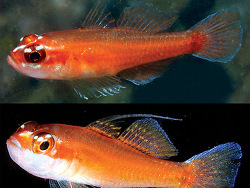 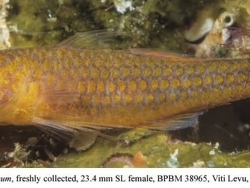 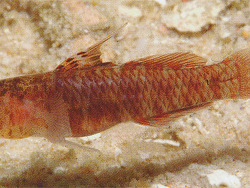 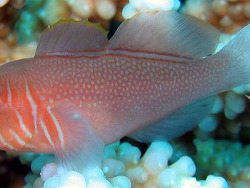 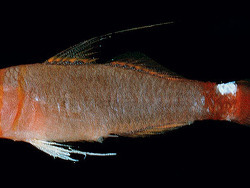 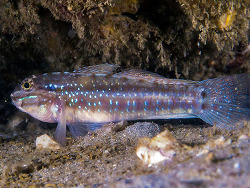 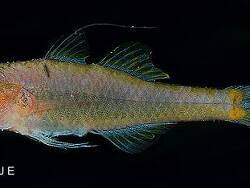 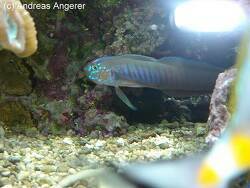 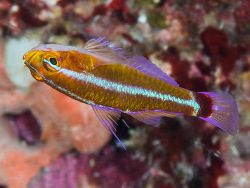 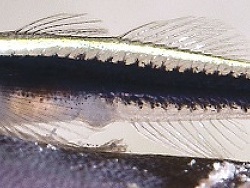 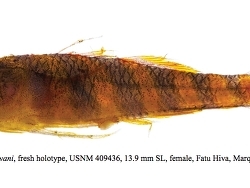 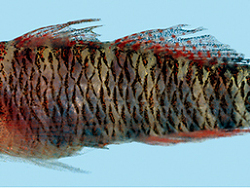 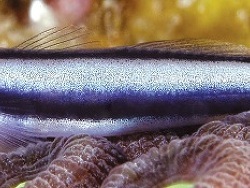 Trimmatom nanus of the Indian Ocean females reach a mere 8-10 mm. 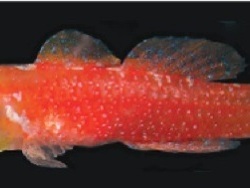 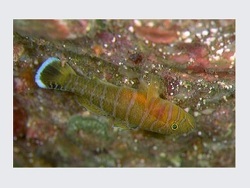 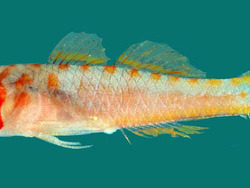 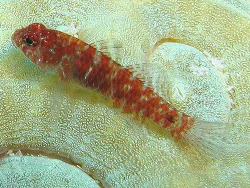 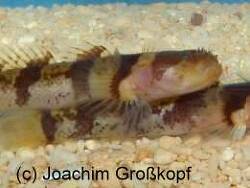 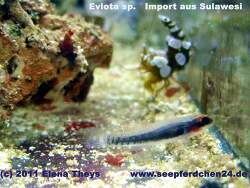 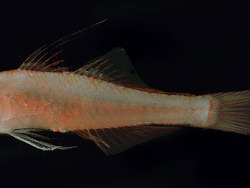 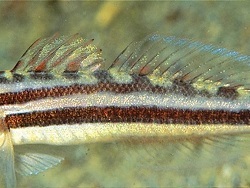 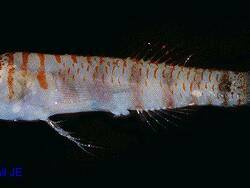 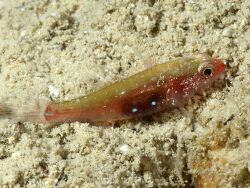 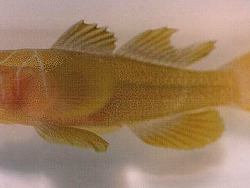 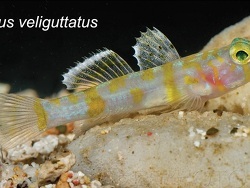 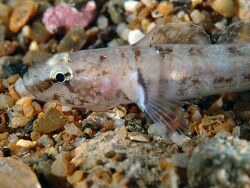 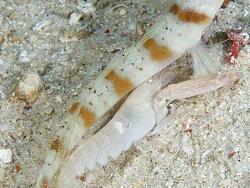 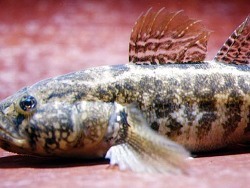 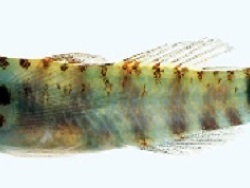 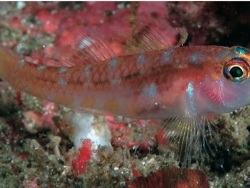 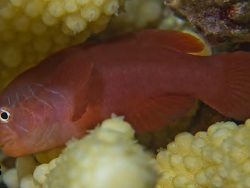 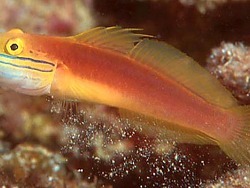 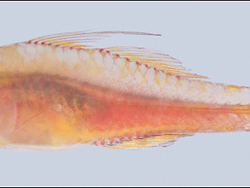 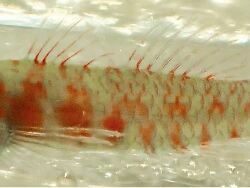 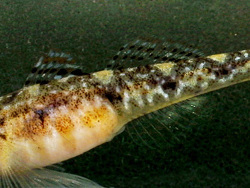 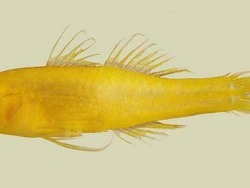 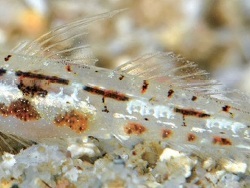 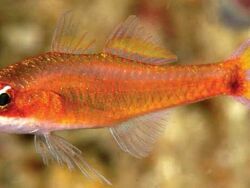 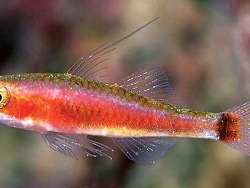 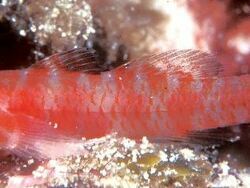 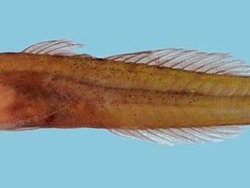 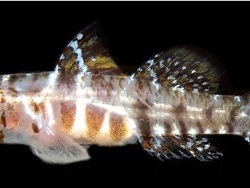 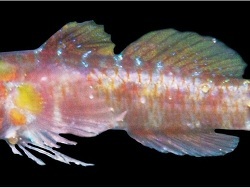 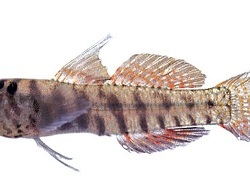 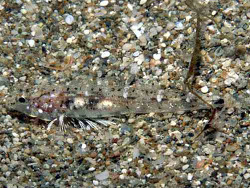 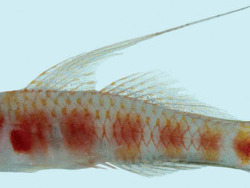 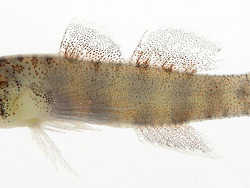 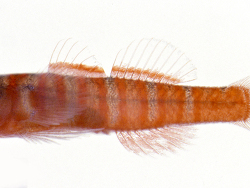 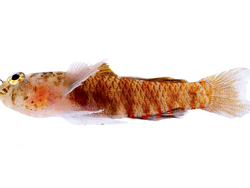 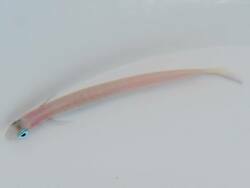 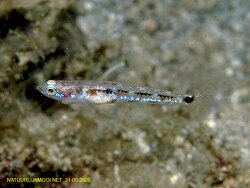 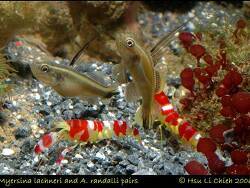 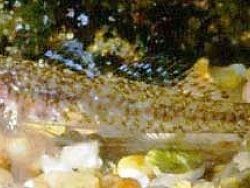 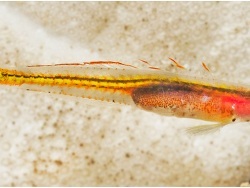 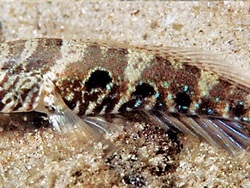 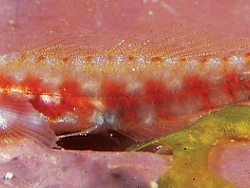 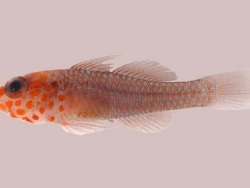 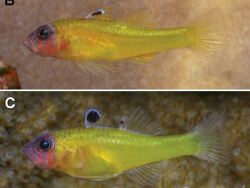 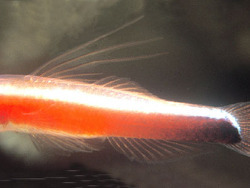 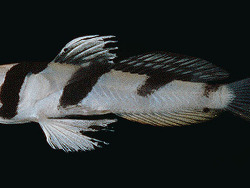 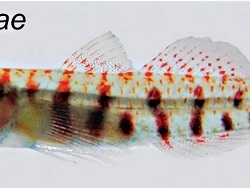 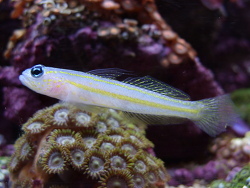 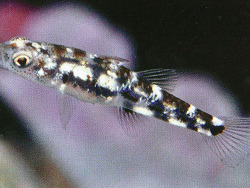 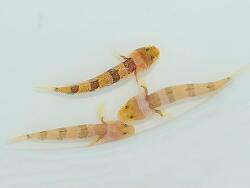 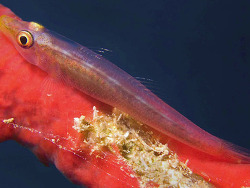 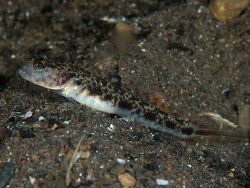 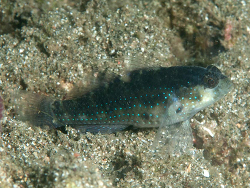 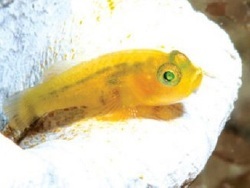 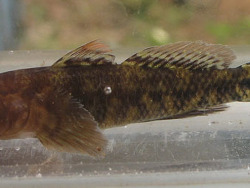 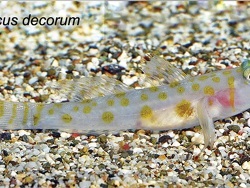 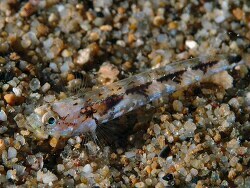 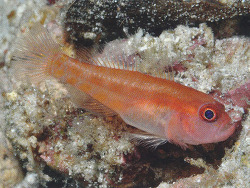 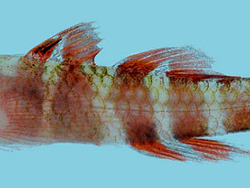 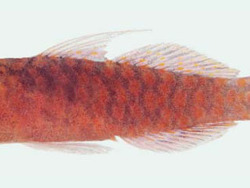 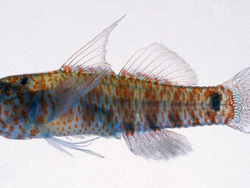 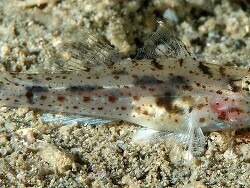 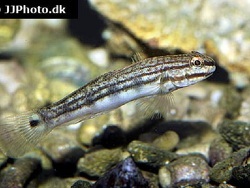 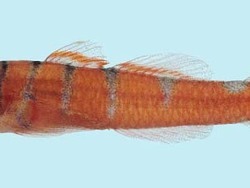 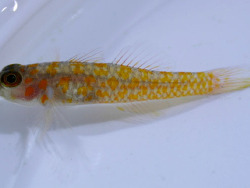 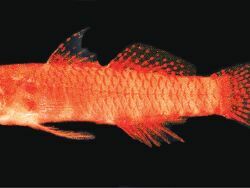 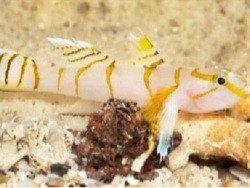 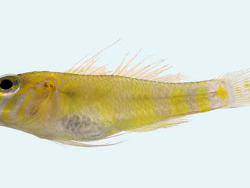 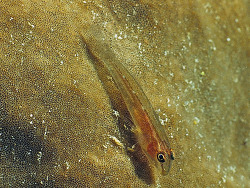 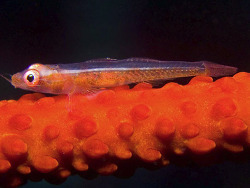 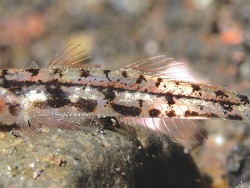 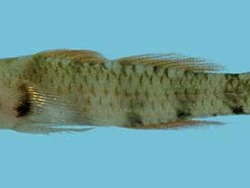 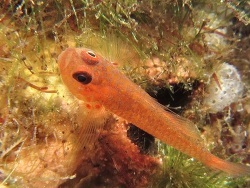 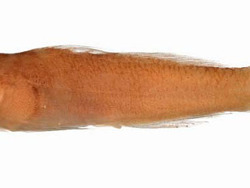 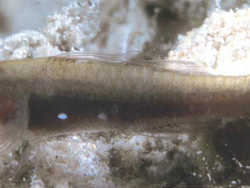 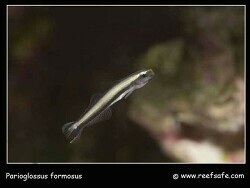 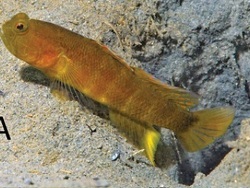 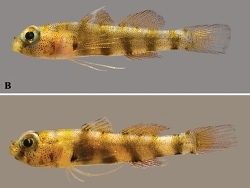 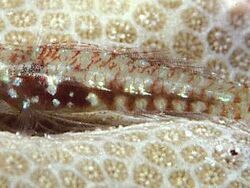 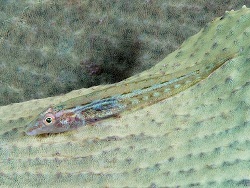 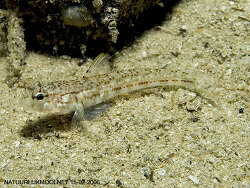 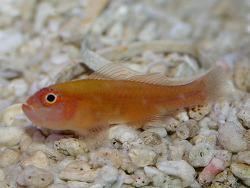 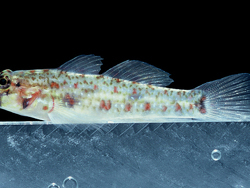 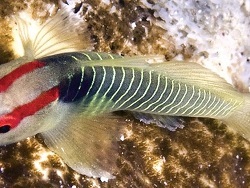 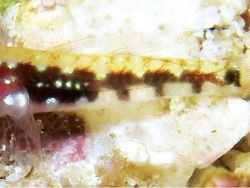 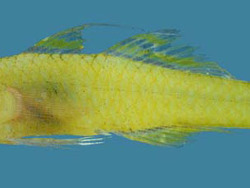 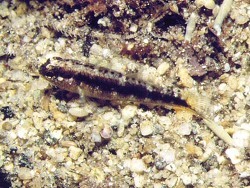 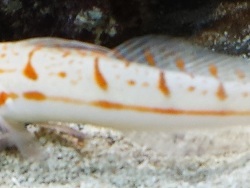 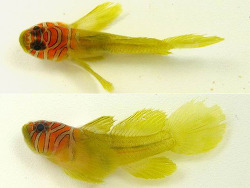 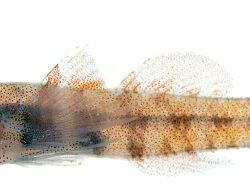 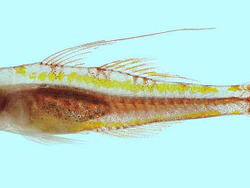 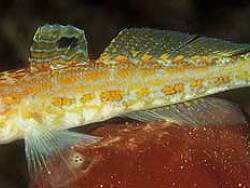 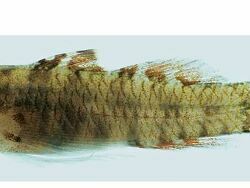 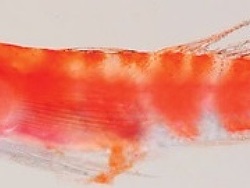 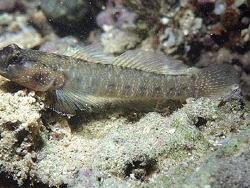 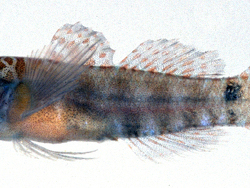 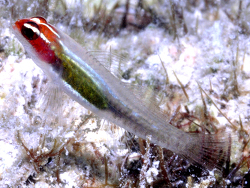 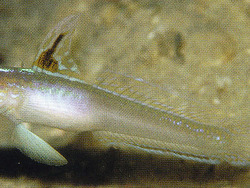 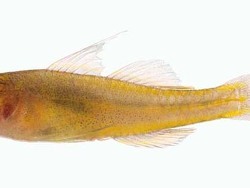 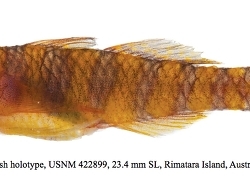 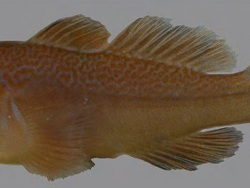 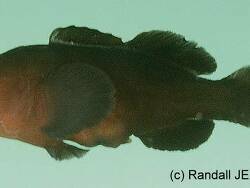 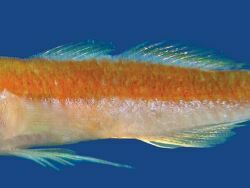 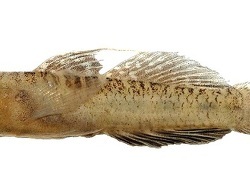 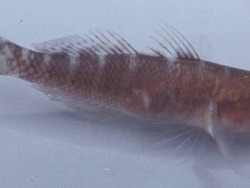 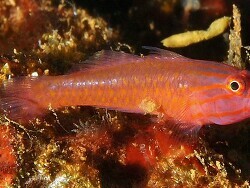 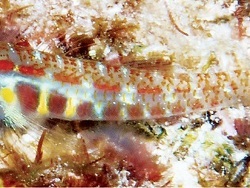 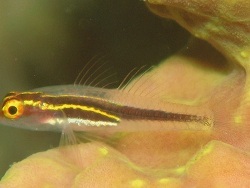 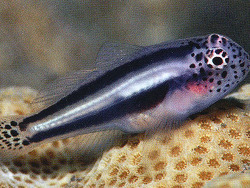 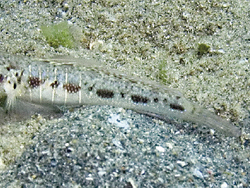 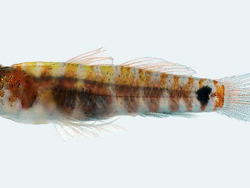 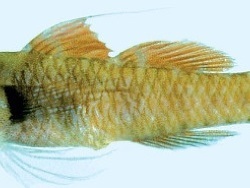 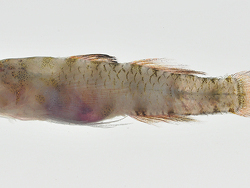 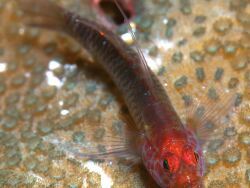 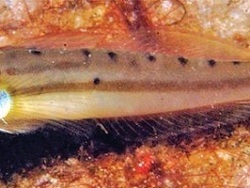 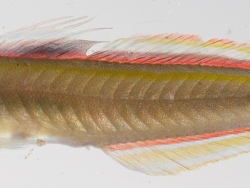 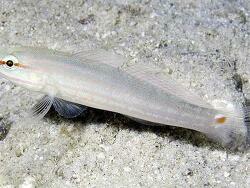 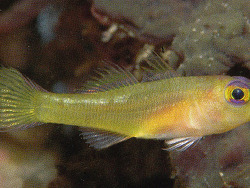 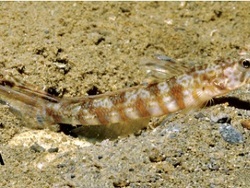 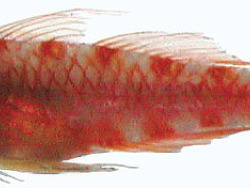 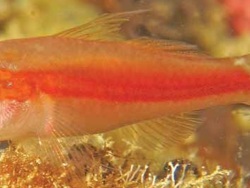 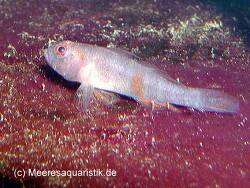 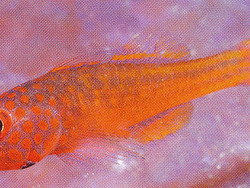 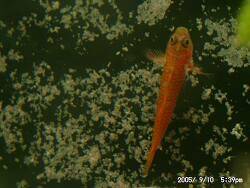 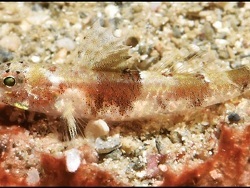 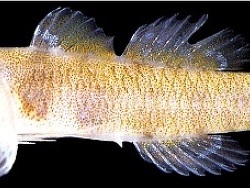 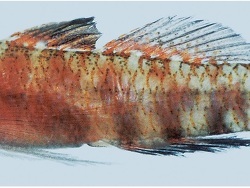 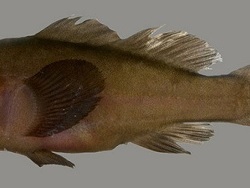 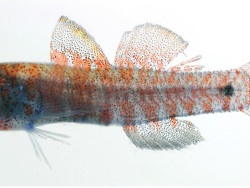 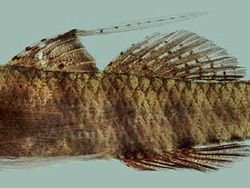 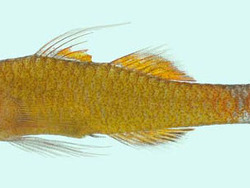 There are other goby species only slightly larger. 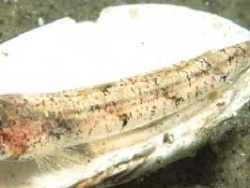 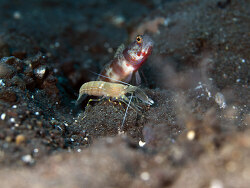 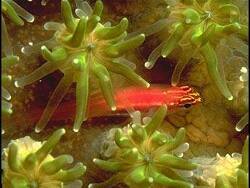 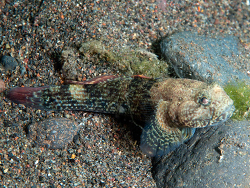 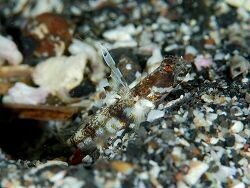 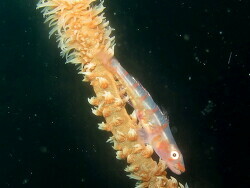 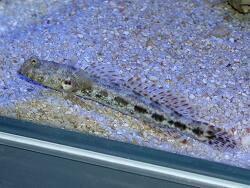 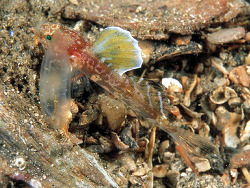 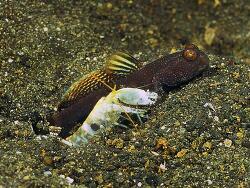 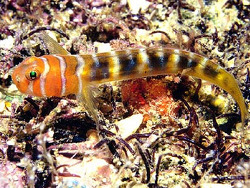 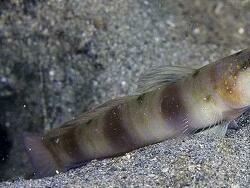 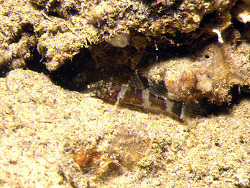 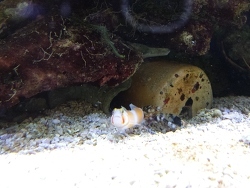 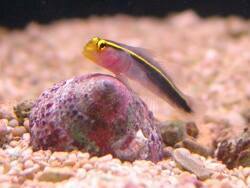 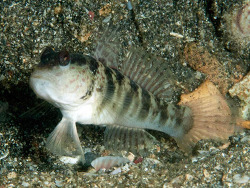 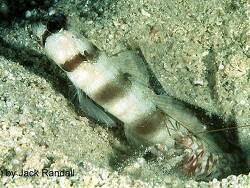 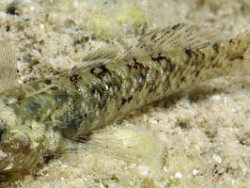 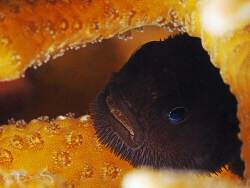 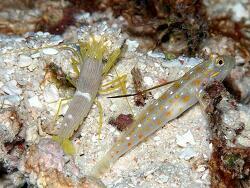 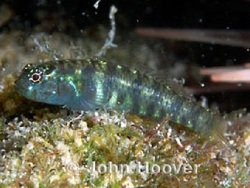 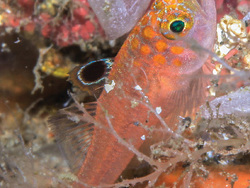 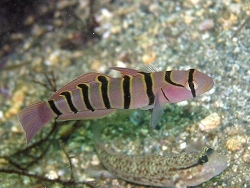 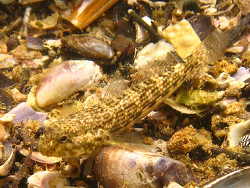 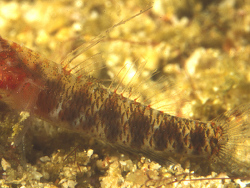 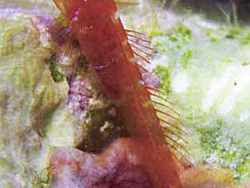 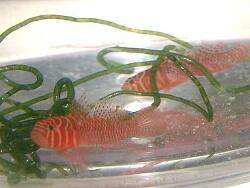 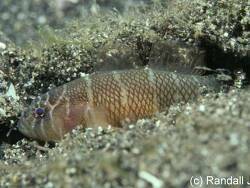 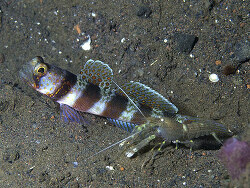 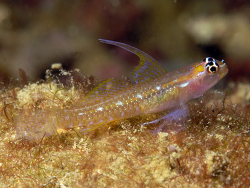 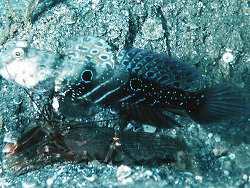 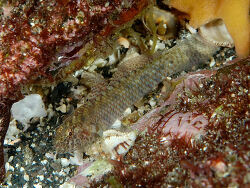 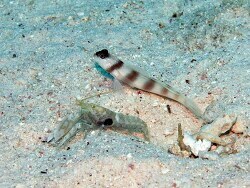 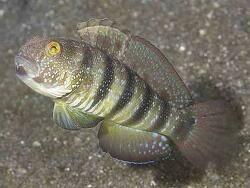 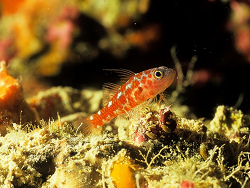 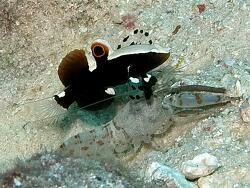 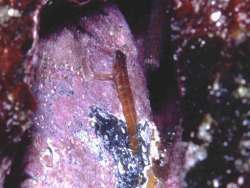 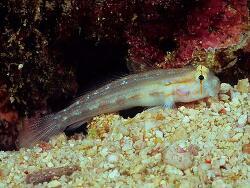 A large group of the gobies live in close association with invertebrates such as shrimps, sponges and sea urchins. 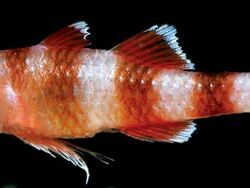 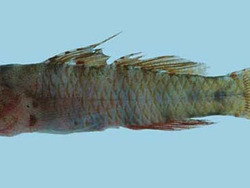 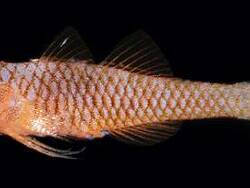 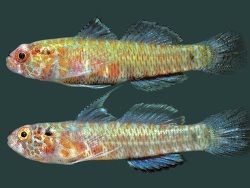 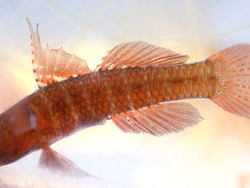 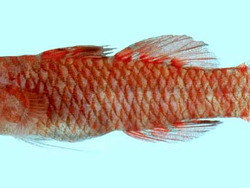 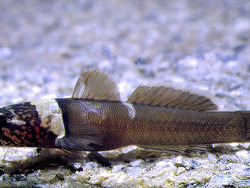 The family Gobiidae contains 267 genera and 2,100 described species with many more to come. 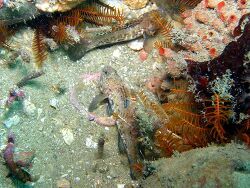 In the meantime, we count about 200 are marine; mostly tropical and subtropical reef. 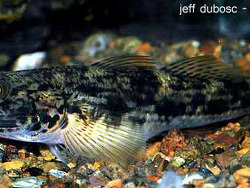 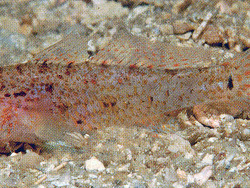 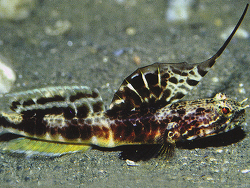 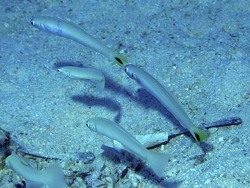 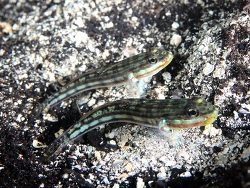 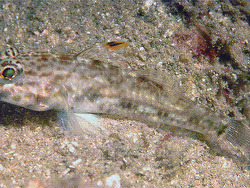 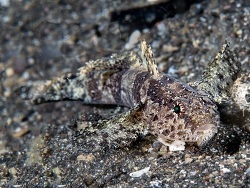 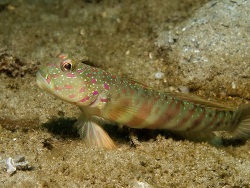 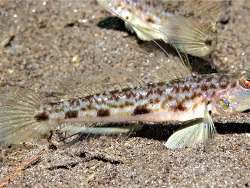 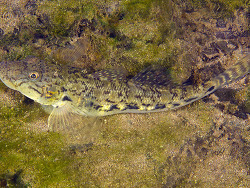 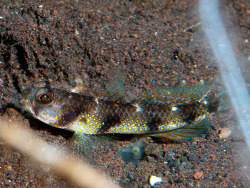 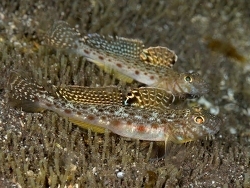 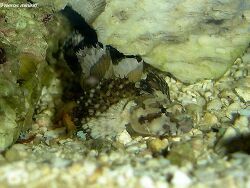 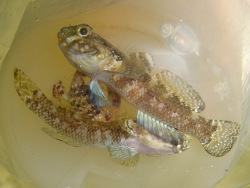 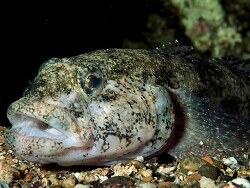 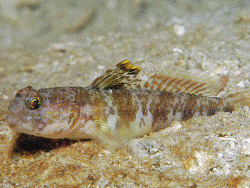 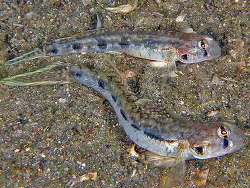 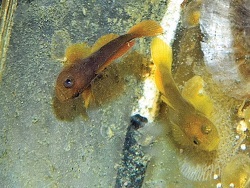 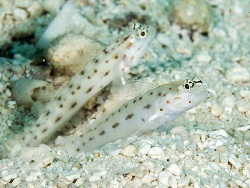 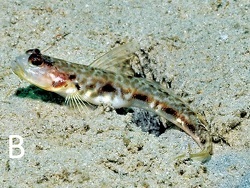 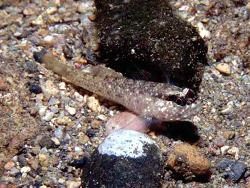 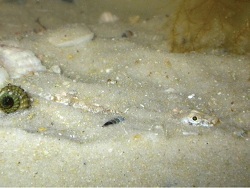 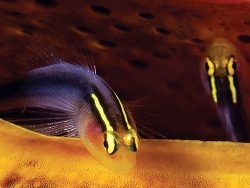 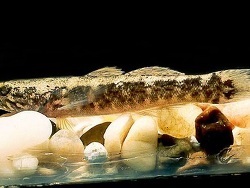 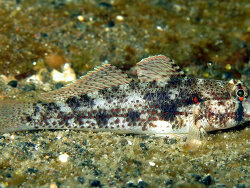 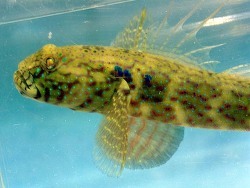 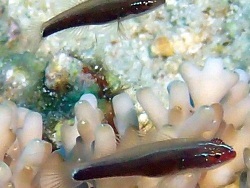 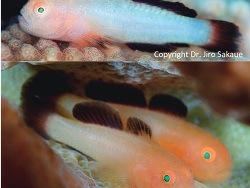 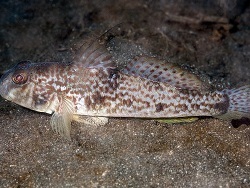 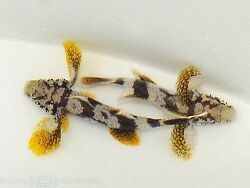 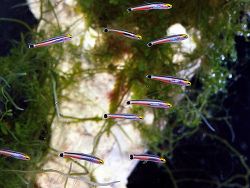 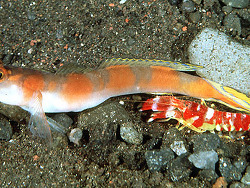 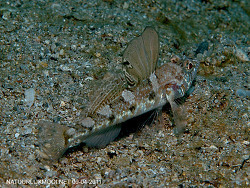 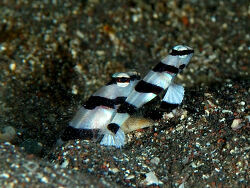 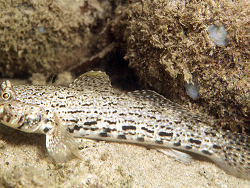 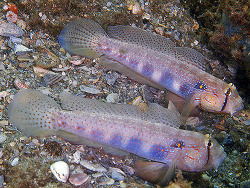 Gobies are grouped together on the basis of several hard to discern characters. 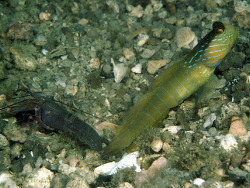 Territoriality can be a big problem with some species. 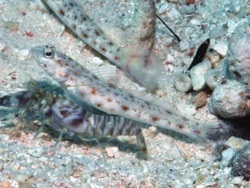 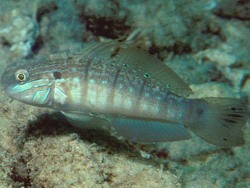 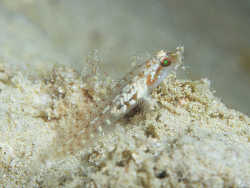 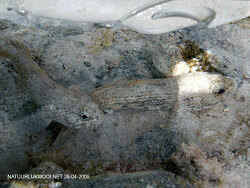 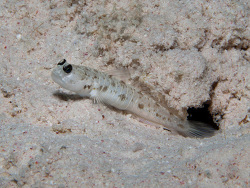 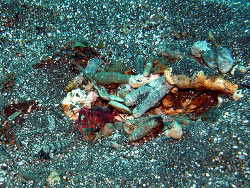 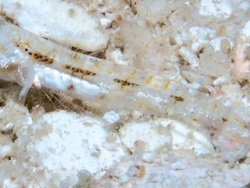 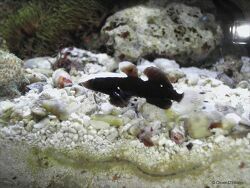 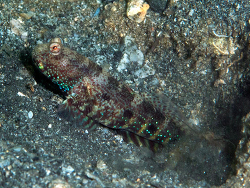 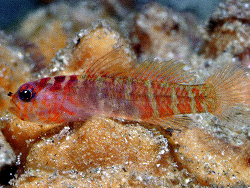 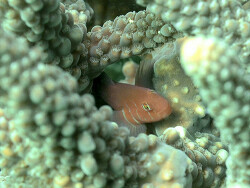 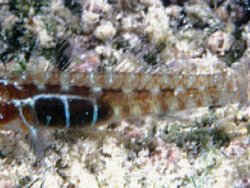 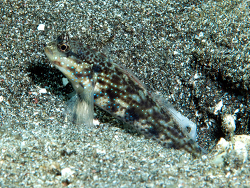 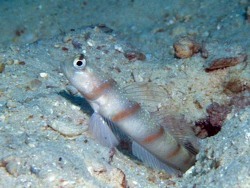 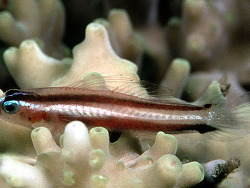 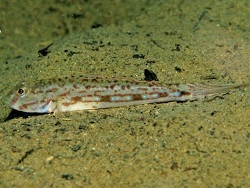 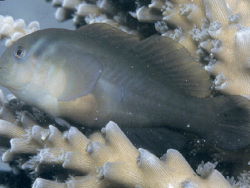 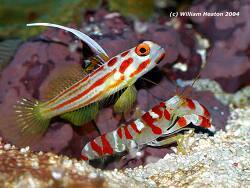 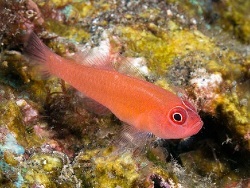 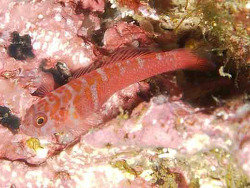 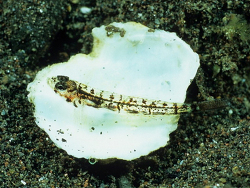 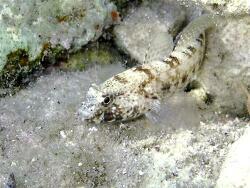 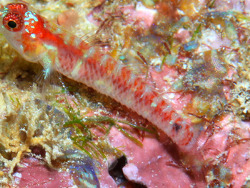 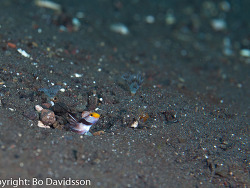 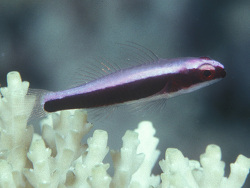 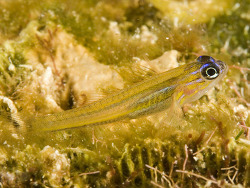 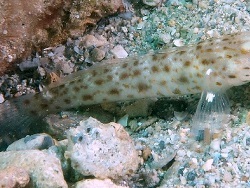 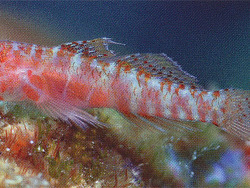 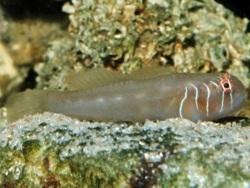 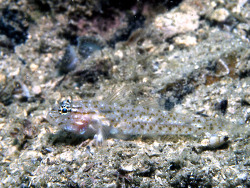 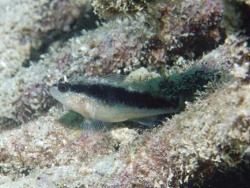 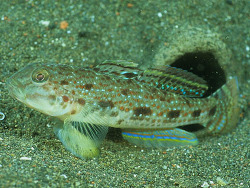 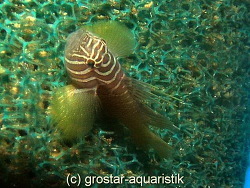 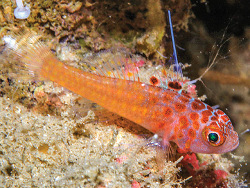 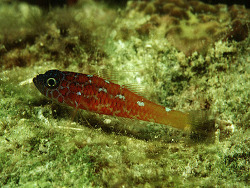 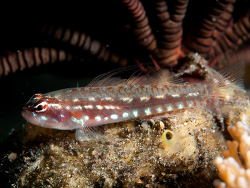 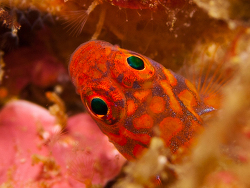 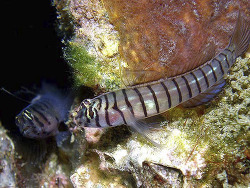 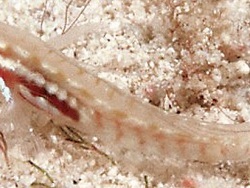 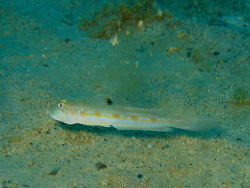 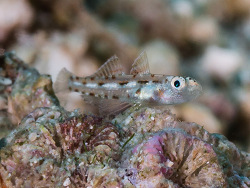 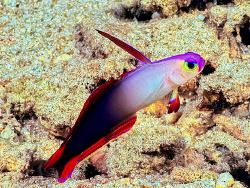 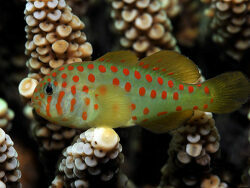 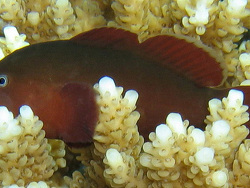 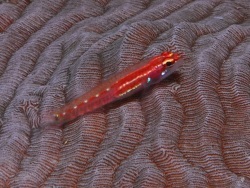 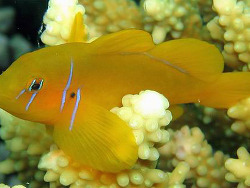 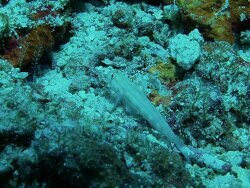 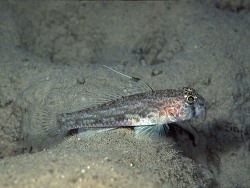 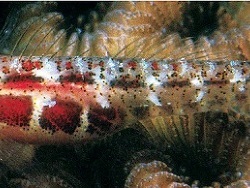 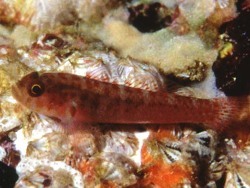 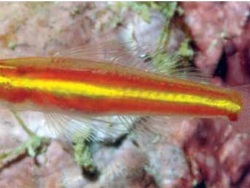 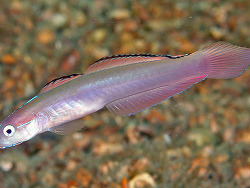 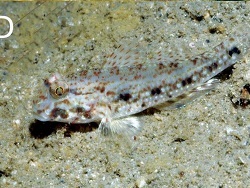 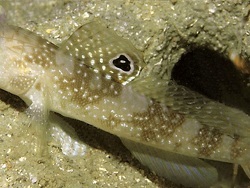 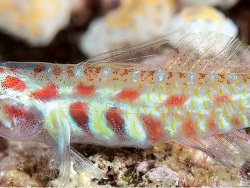 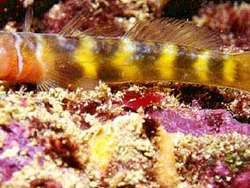 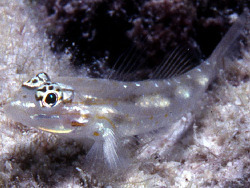 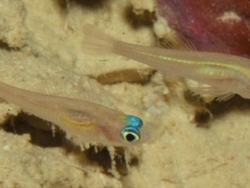 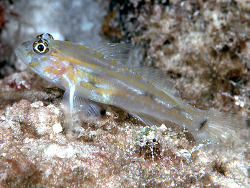 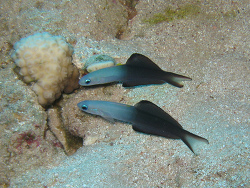 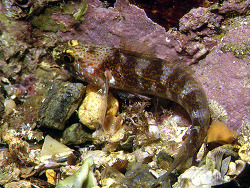 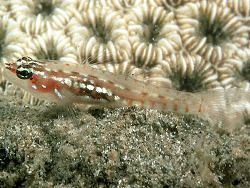 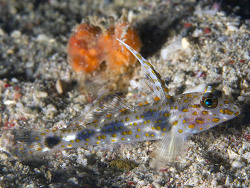 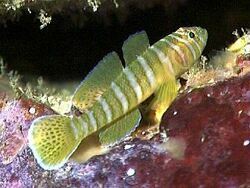 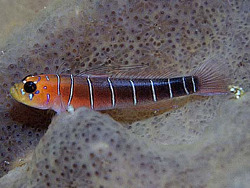 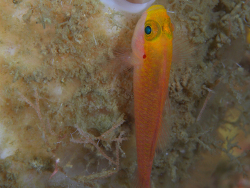 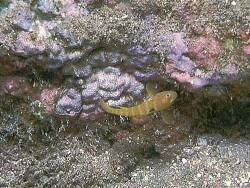 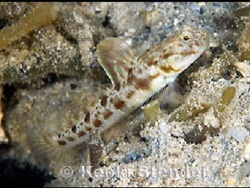 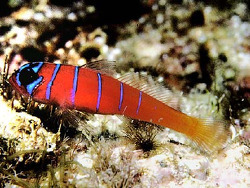 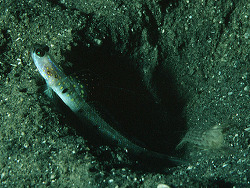 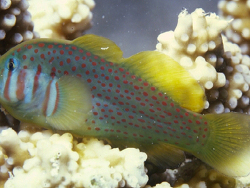 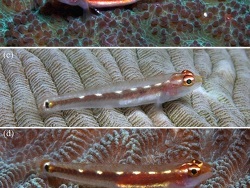 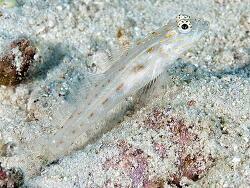 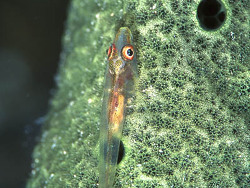 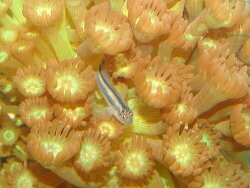 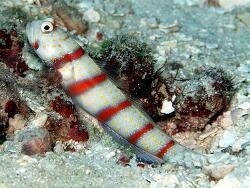 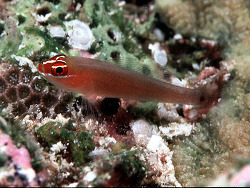 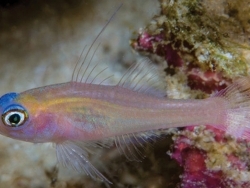 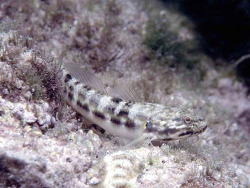 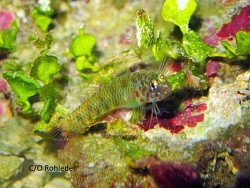 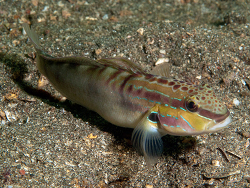 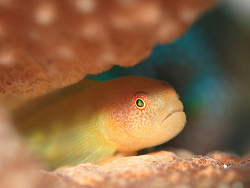 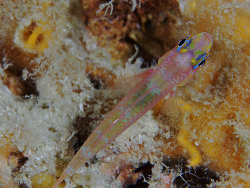 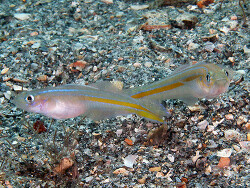 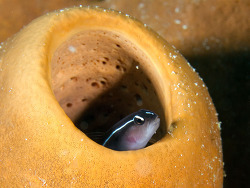 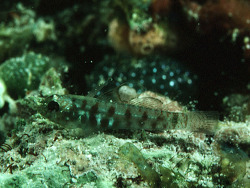 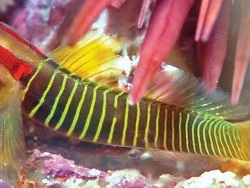 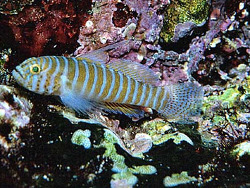 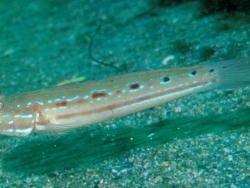 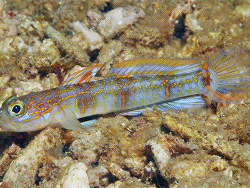 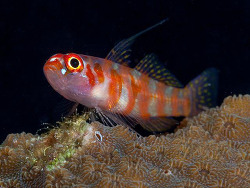 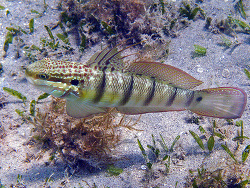 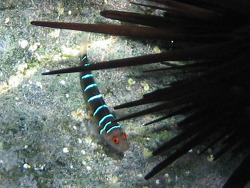 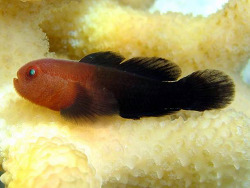 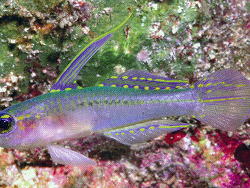 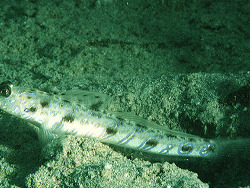 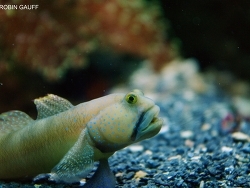 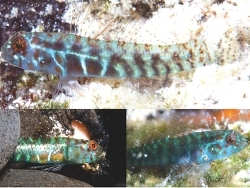 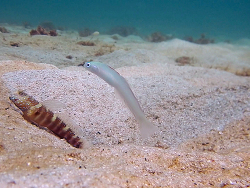 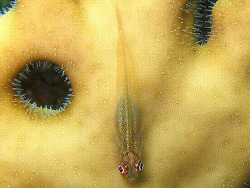 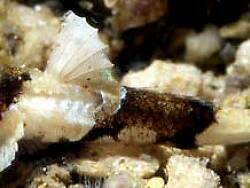 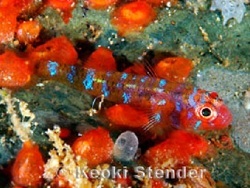 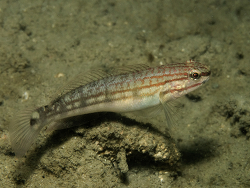 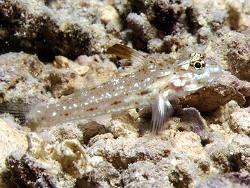 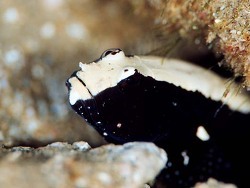 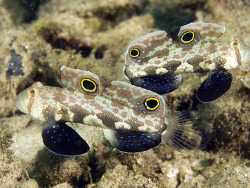 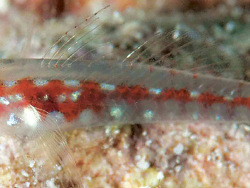 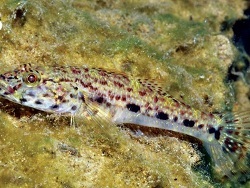 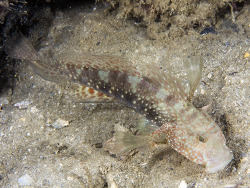 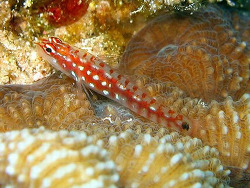 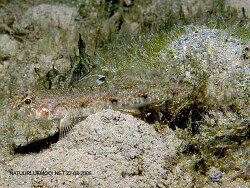 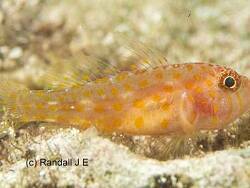 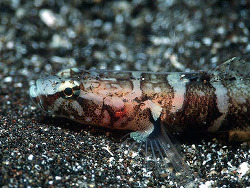 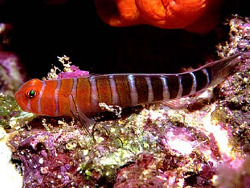 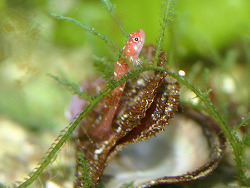 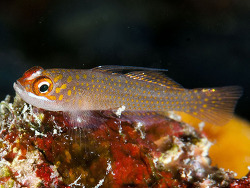 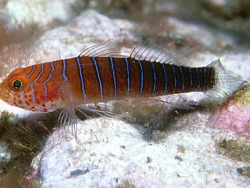 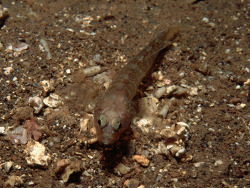 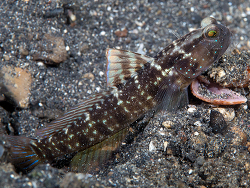 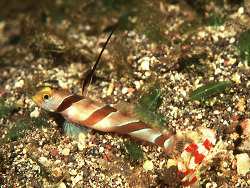 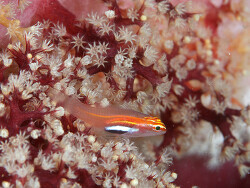 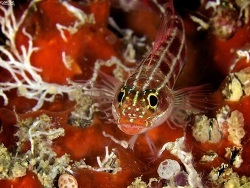 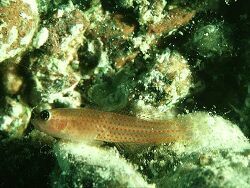 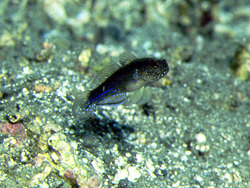 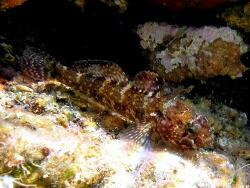 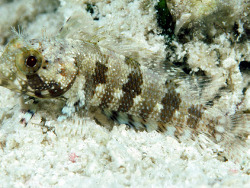 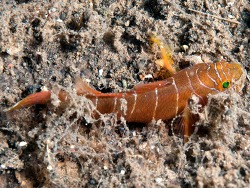 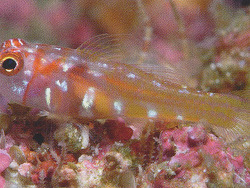 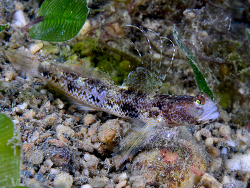 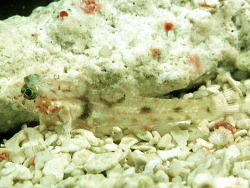 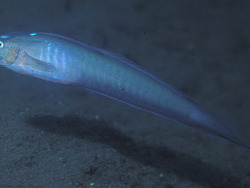 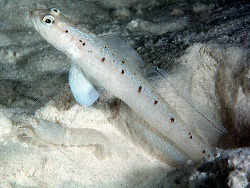 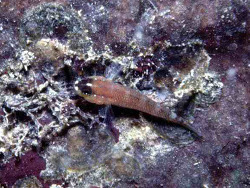 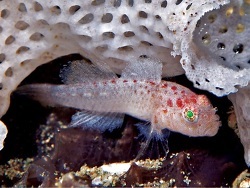 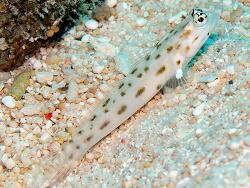 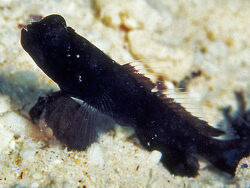 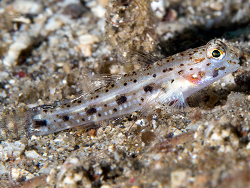 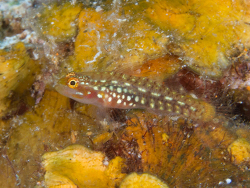 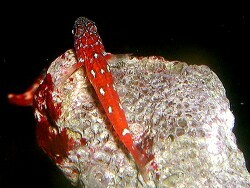 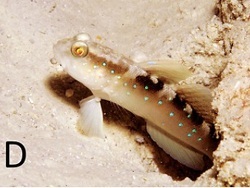 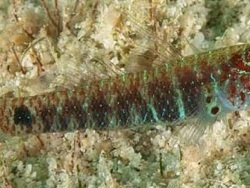 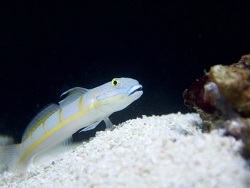 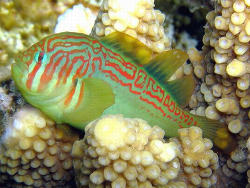 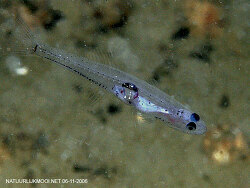 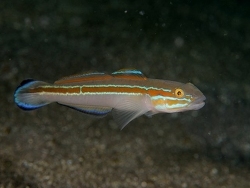 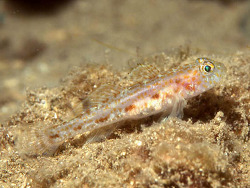 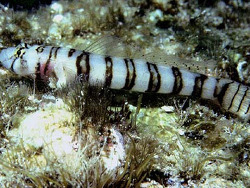 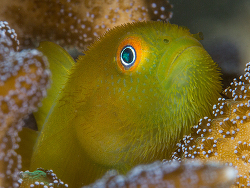 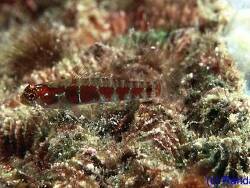 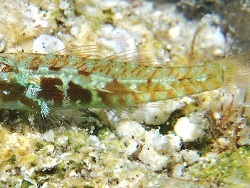 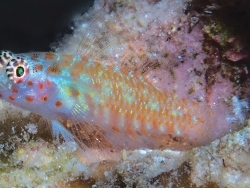 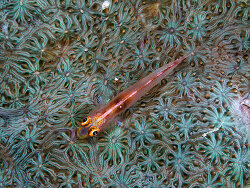 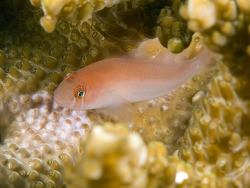 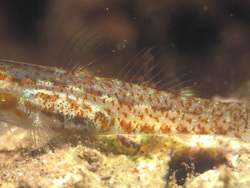 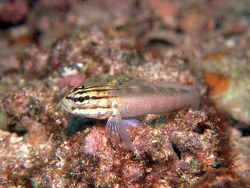 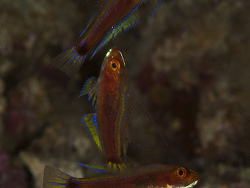 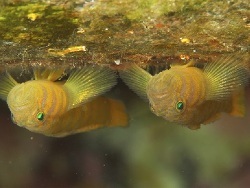 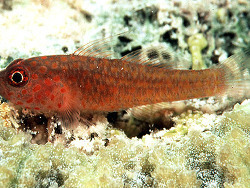 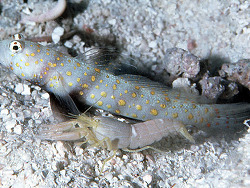 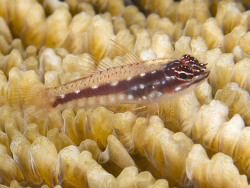 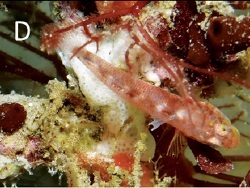 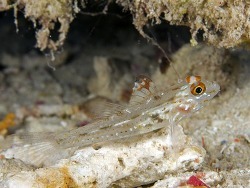 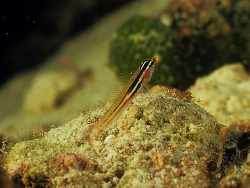 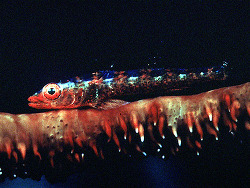 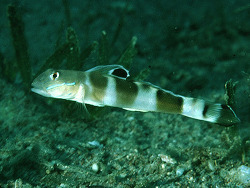 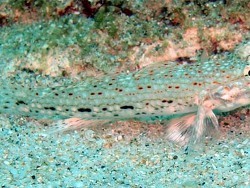 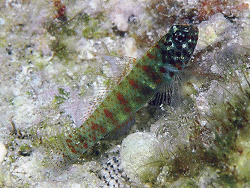 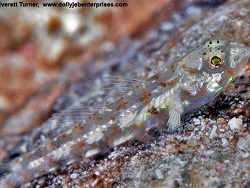 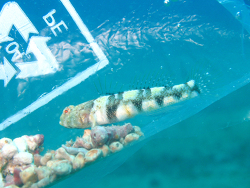 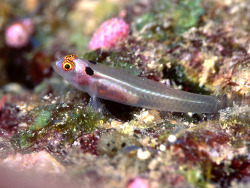 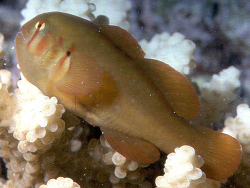 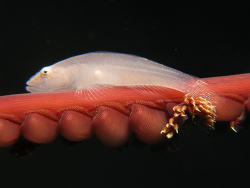 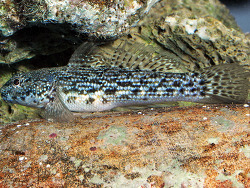 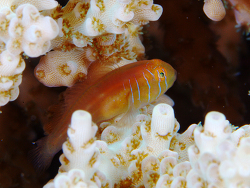 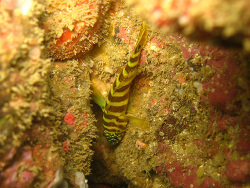 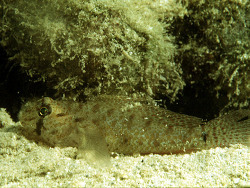 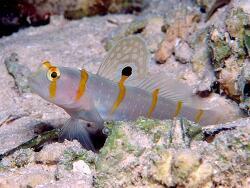 Gobies occur in large numbers in all reef-associated habitats. 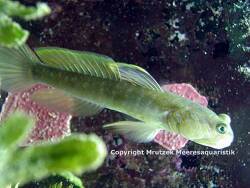 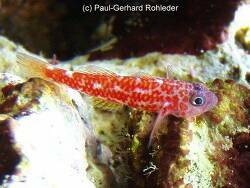 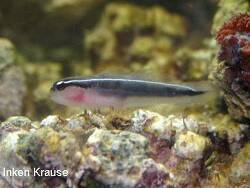 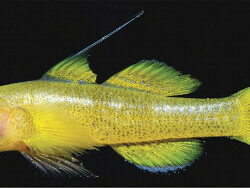 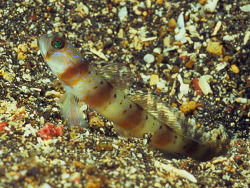 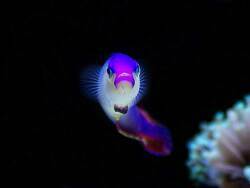 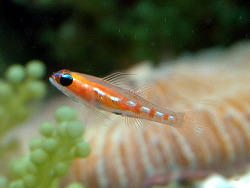 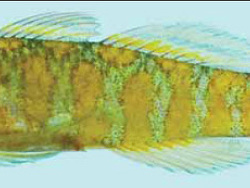 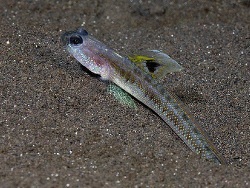 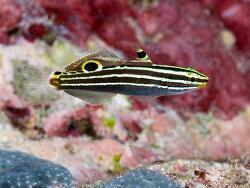 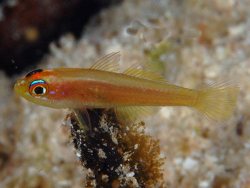 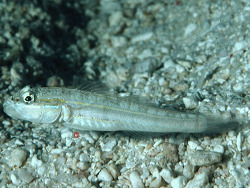 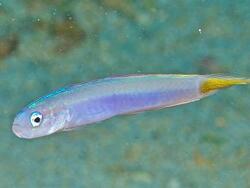 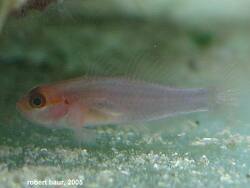 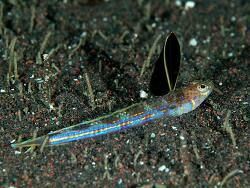 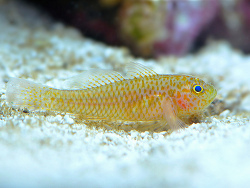 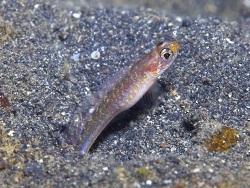 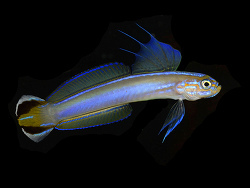 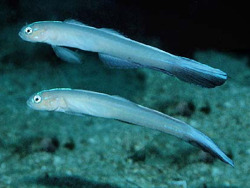 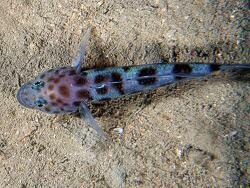 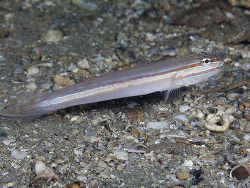 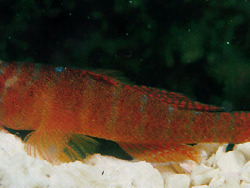 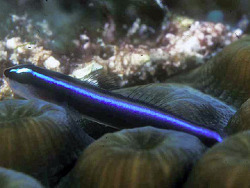 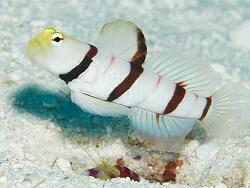 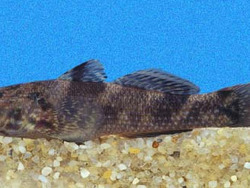 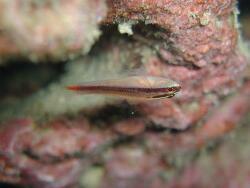 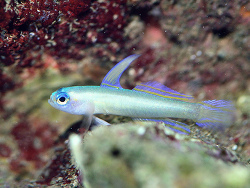 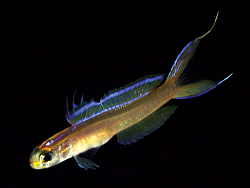 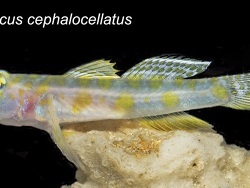 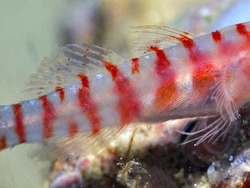 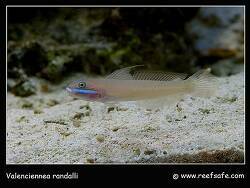 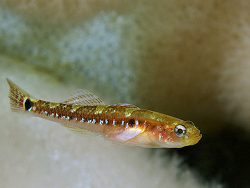 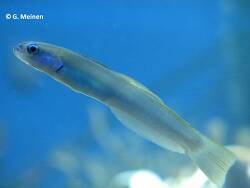 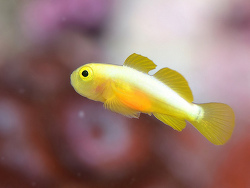 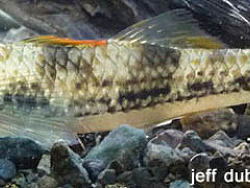 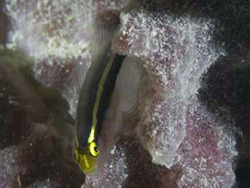 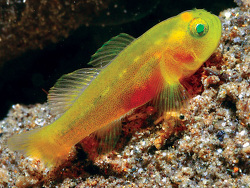 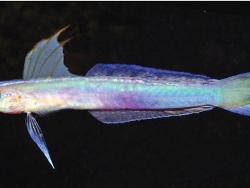 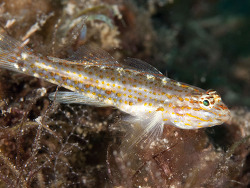 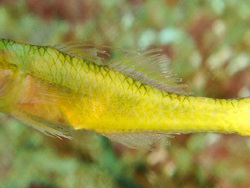 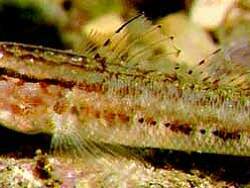 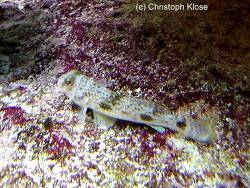 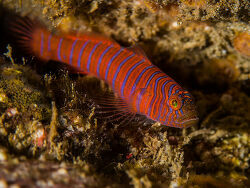 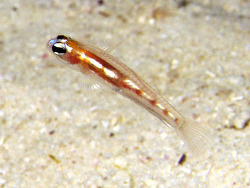 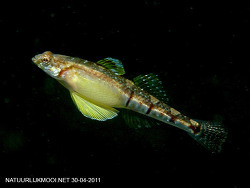 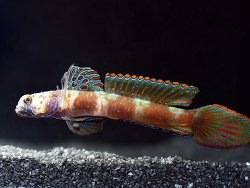 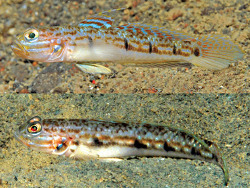 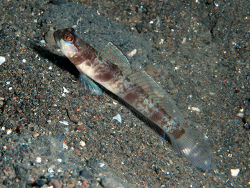 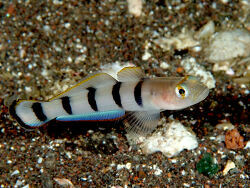 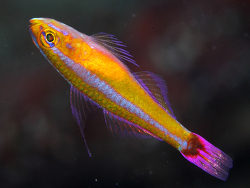 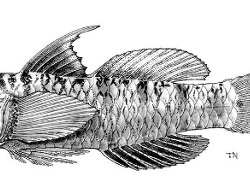 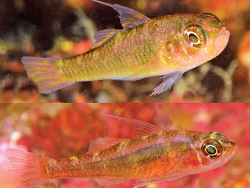 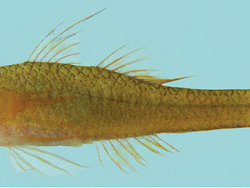 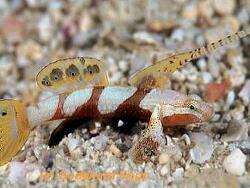 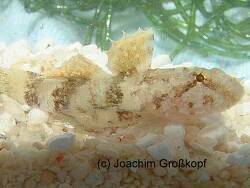 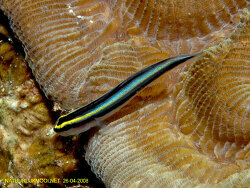 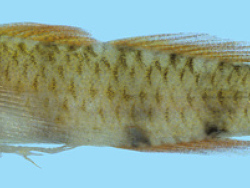 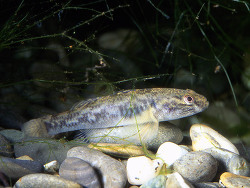 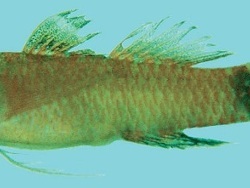 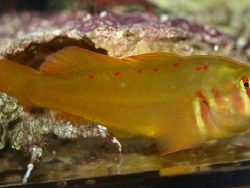 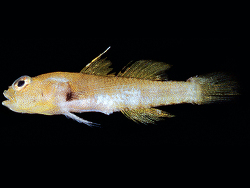 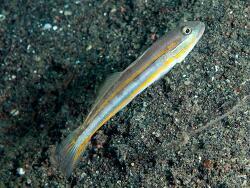 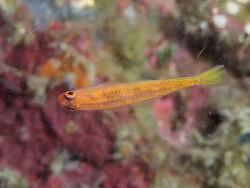 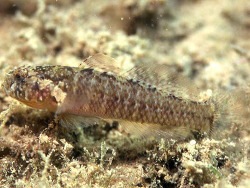 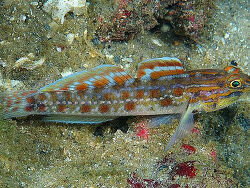 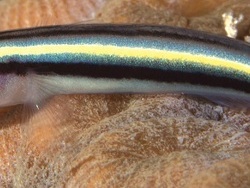 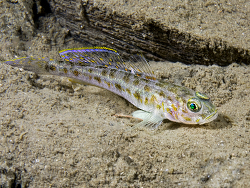 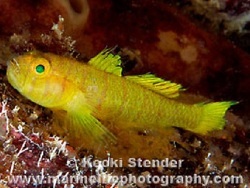 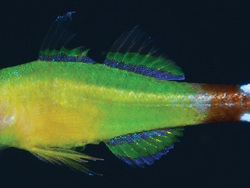 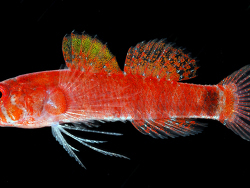 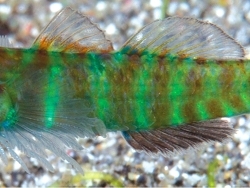 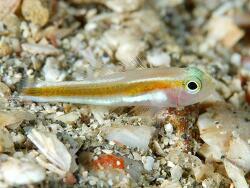 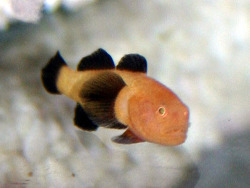 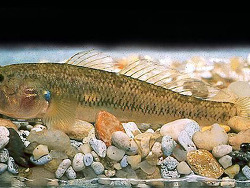 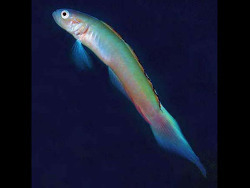 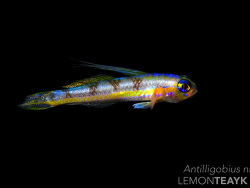 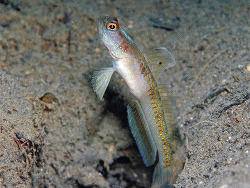 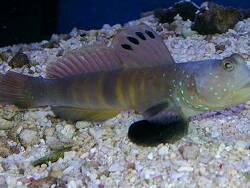 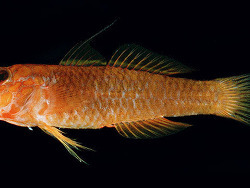 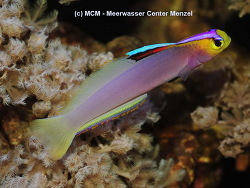 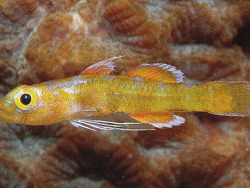 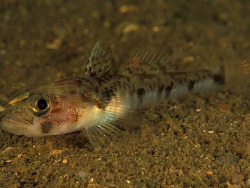 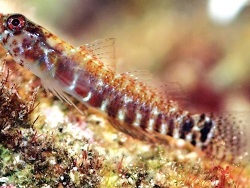 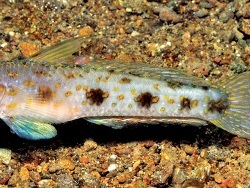 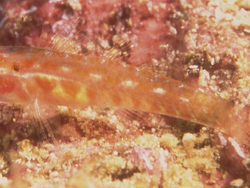 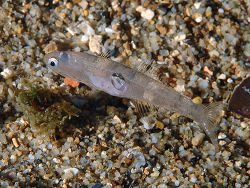 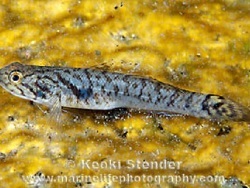 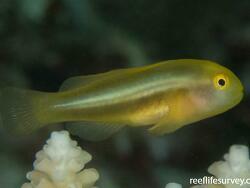 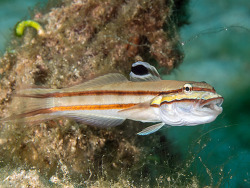 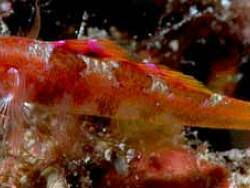 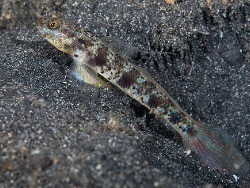 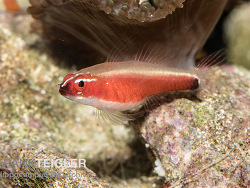 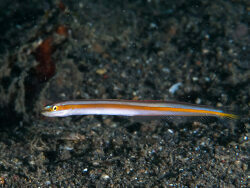 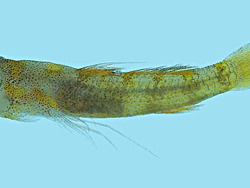 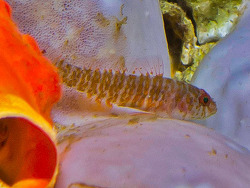 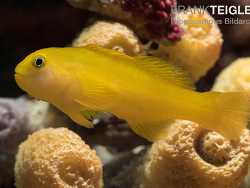 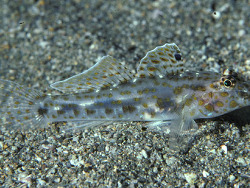 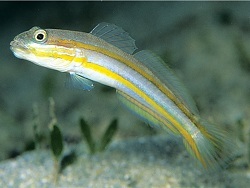 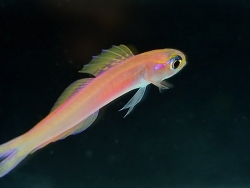 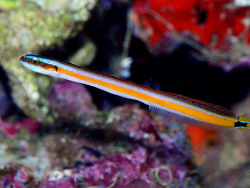 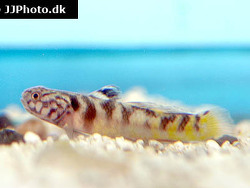 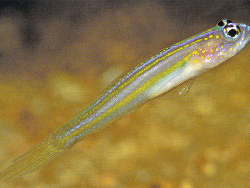 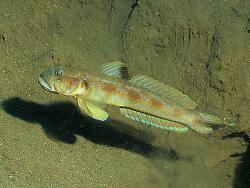 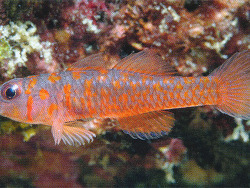 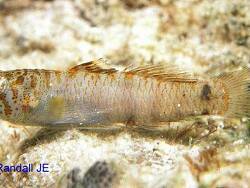 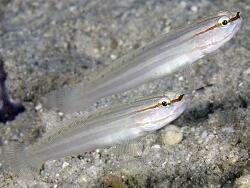 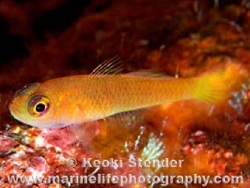 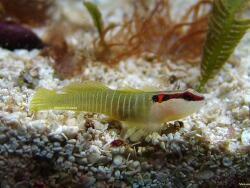 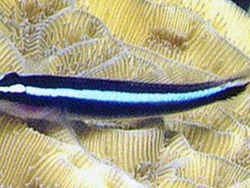 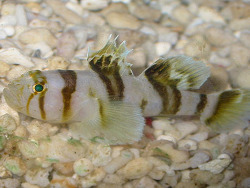 In general, the most gobies are small and nondescript with a long, narrow, and thin body. 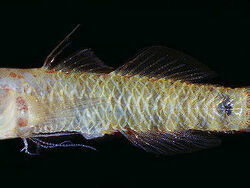 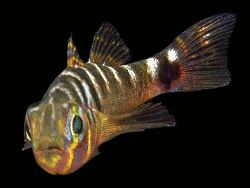 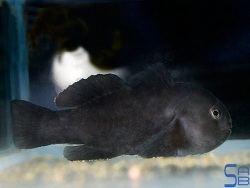 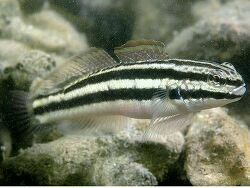 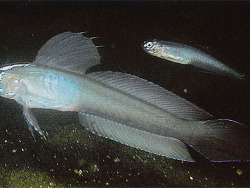 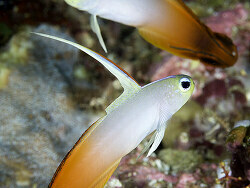 They tend to have small to medium-sized terminal mouths, small heads without spines, and flexible spines in the fins. 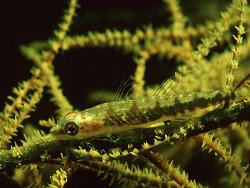 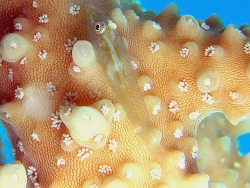 They can be recognized most readily by their two separated dorsal fins with the first having only a few spindly spines. 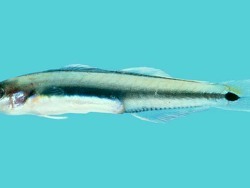 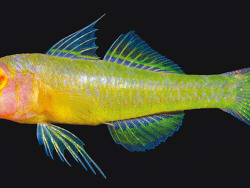 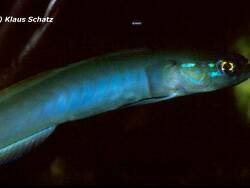 In addition, they often have fused pelvic fins and typically light markings. 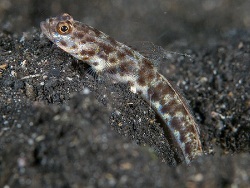 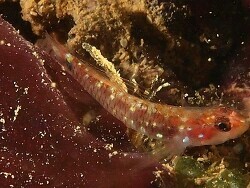 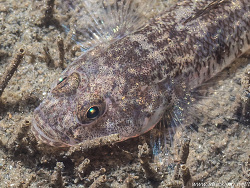 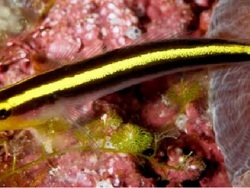 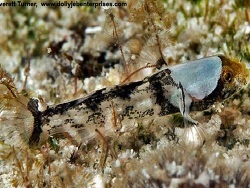 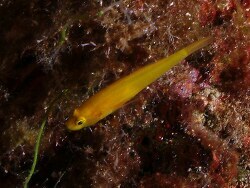 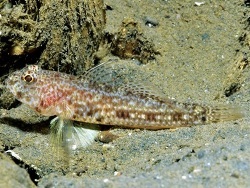 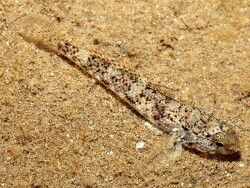 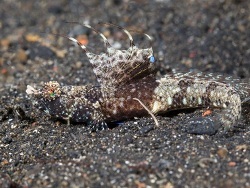 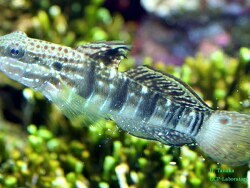 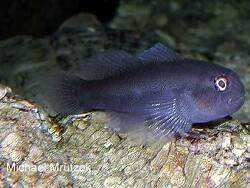 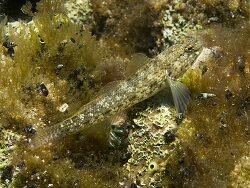 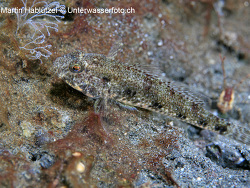 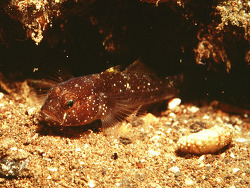 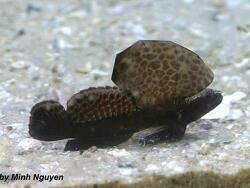 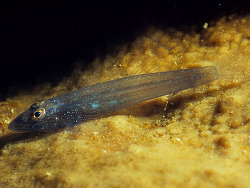 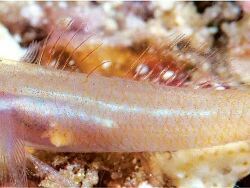 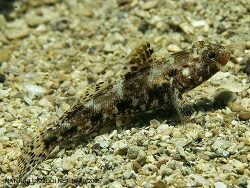 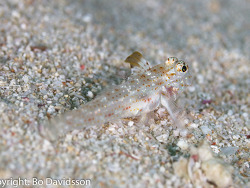 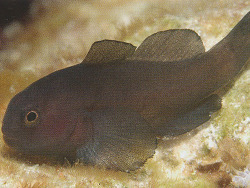 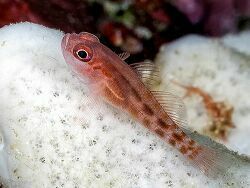 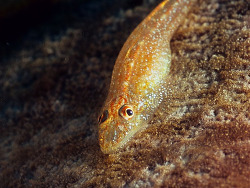 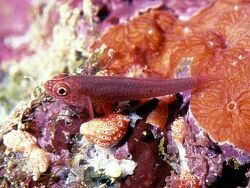 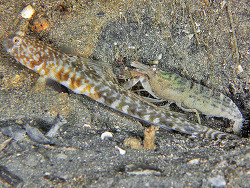 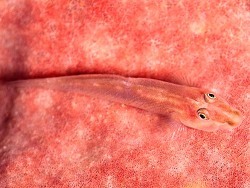 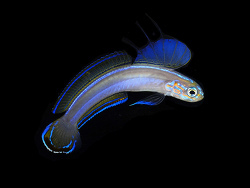 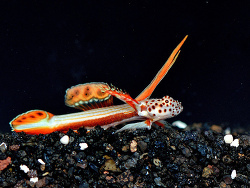 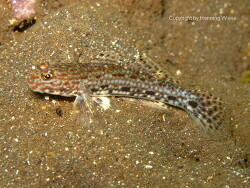 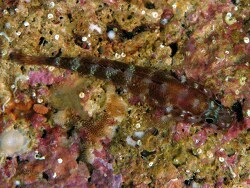 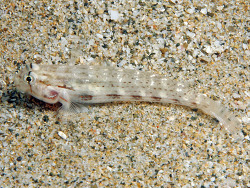 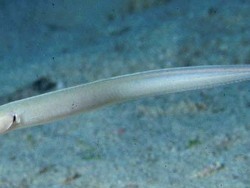 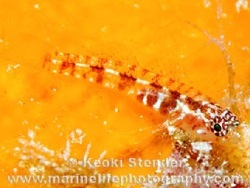 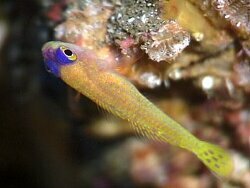 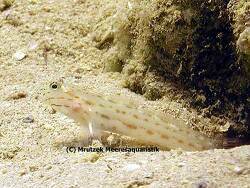 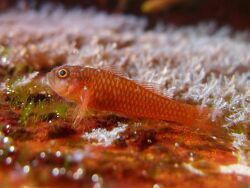 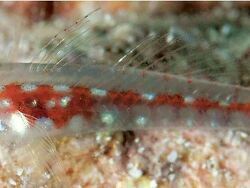 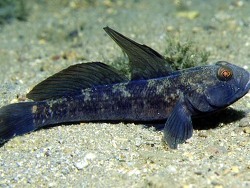 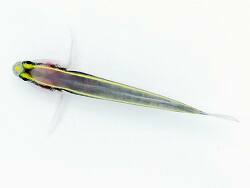 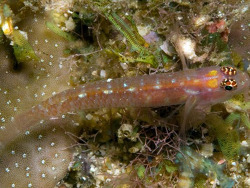 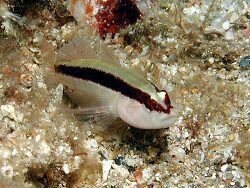 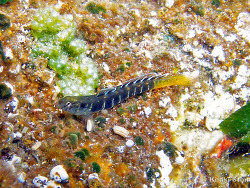 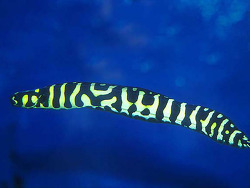 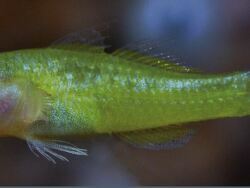 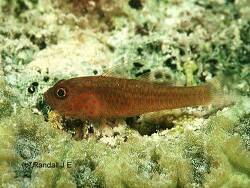 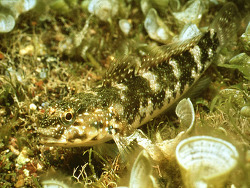 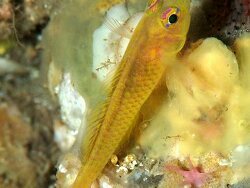 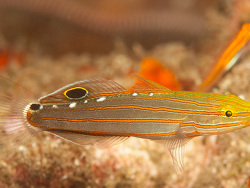 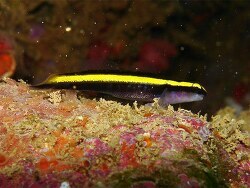 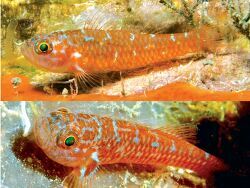 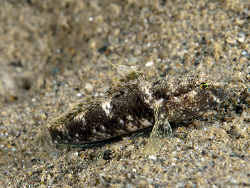 They are sometimes confused with Blennies but Gobies have two separate dorsal fins while Blennies have only one long one. 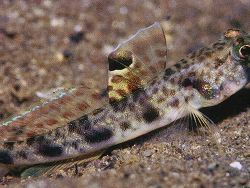 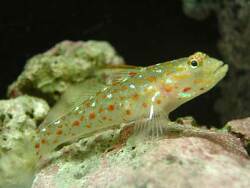 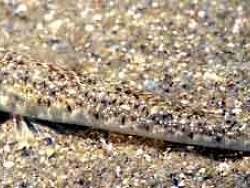 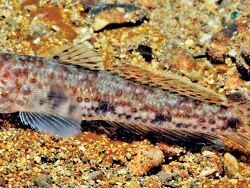 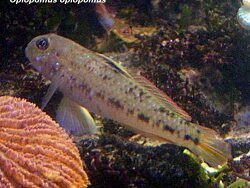 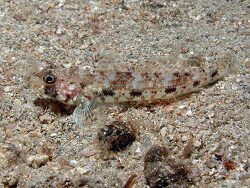 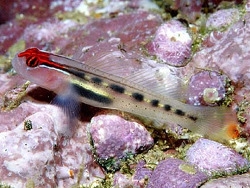 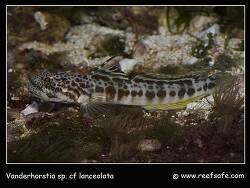 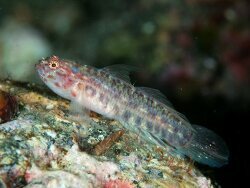 Gobies are mainly bottom dwelling fishes and are found in tide pools and shallow waters near coral reefs throughout the world. 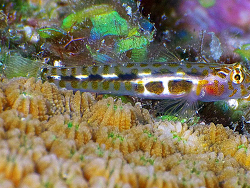 Some species can be quite colorful while others are drabber and covered with spots and stripes to blend in with their surroundings. 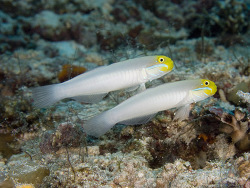 With many species it is difficult to distinguish between the sexes. 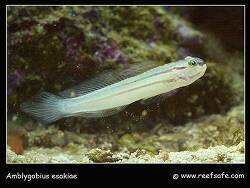 Gobioids do best in an aquarium with a lot of rocks and crevices to hide in. 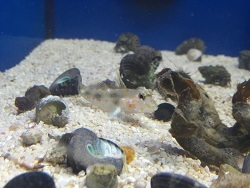 These fish are jumpers so the tank should have a secure cover. 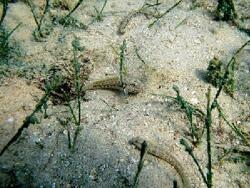 They are for the most part relatively disease resistant, with the exception of one type of disease, ENVIRONMETAL. 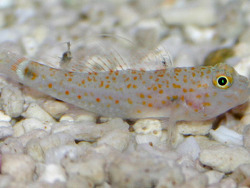 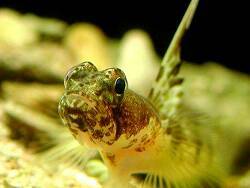 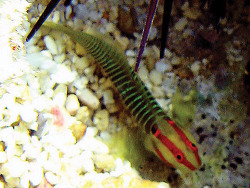 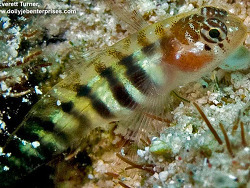 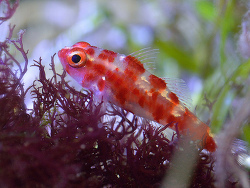 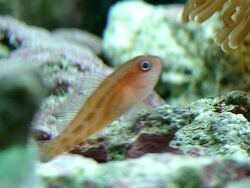 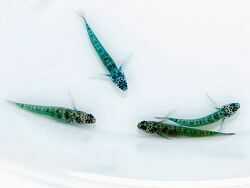 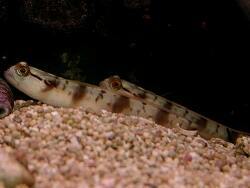 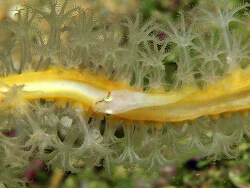 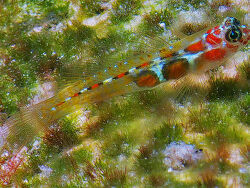 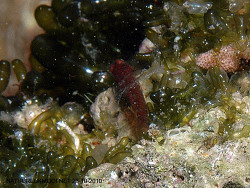 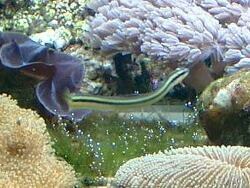 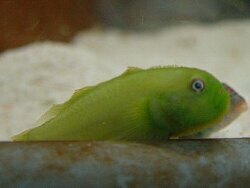 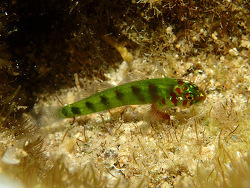 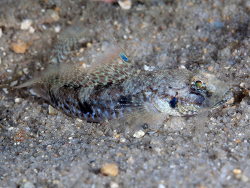 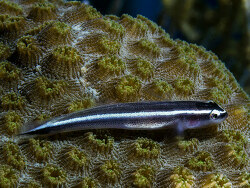 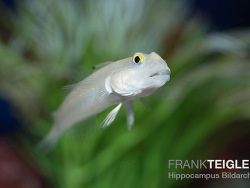 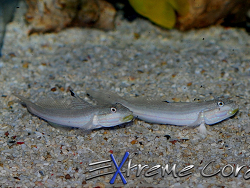 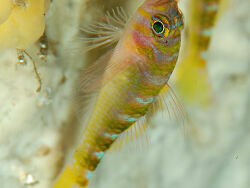 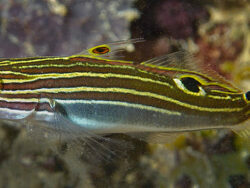 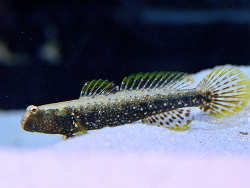 Gobies feed on a variety of things including algae, plankton, and small invertebrates.